This space combines many classic features of an old-world wine cellar. The racks rise from a classic stone tile floor supported by a tongue & grooved cedar platform with scrolled cedar baseboards. The racking design incorporates many diverse elements including eight open cedar shelves and an accessory drawer, vertical and horizontal bottle racks, several diamond cube sections and a floor-to-ceiling wine case cabinet. Both ends of the room are capped by rounded display shelves. The room boasts two granite counter tops, one inside a mirrored cedar arch with LED spot light, the other serving as a tasting table complete with imported mosaic tile back splash and bordered by horizontal racking and overhead stemware holders. The cooling and humidity systems are set inside the racks and hidden by attractive grills. The wine racks are encircled by a lighted bottle display row and at the top by cedar crown molding. The ceiling is accented by cedar panels set between the lighted support bulkheads. The finishing touches are a wrought iron chandelier and a mosaic of wooden wine crate labels fastened to the entrance wall. This rich granite counter and imported tile mosaic back splash add elegance and a Mediterranean flavor to at home wine tasting. The stylish entrance alcove wall is lined with wooden wine case labels and a large glass flask full of corks. These labels and logos provide visitors and guests with an indelible impression of good taste and a hint of the superb wine collection stored within. 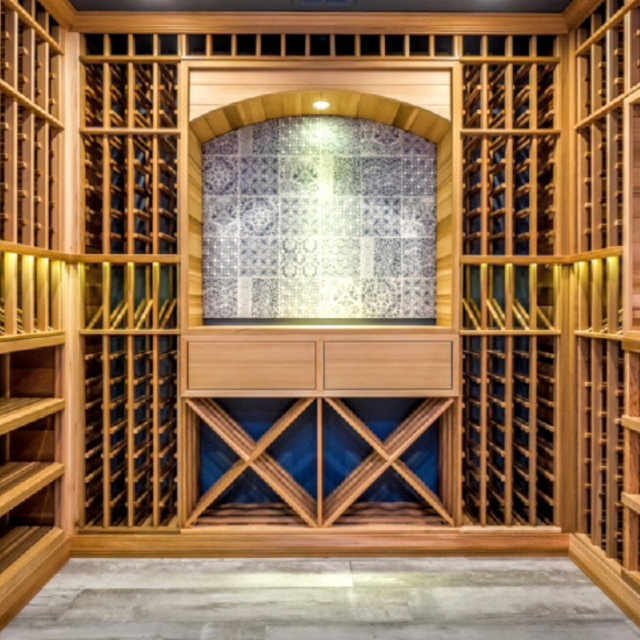 From the initial planning stages to the completed project John's attention to detail, ability to customize to my specifications, willingness to work within my budget and listen/address my concerns/expectations turned a 20-year wine cellar dream into reality. I would not hesitate to recommend Warm Timber for any wine cellar project.